This week I'm thinking about the profusion of work, cartooning very much included, that has entered the public domain in the United States for the first time in twenty years. As of January 1st, 2019, everything published in 1923 in the U.S. has become free for reproduction, distribution, adaptation and transformation without license from the creators or copyright holders. Which doesn't mean that everything is immediately available, of course: despite the heroic digitization efforts of a wide variety of archivists, there is still plenty missing from the pre-1923 record, and three months into the new year the surface has only been scratched on 1923. Still, there's enough of a surface for even the most cursory scratch to come away with gold under its fingernails. Below I reproduce some forty cartoons that were published in New York's flagship weekly humor magazine, Life, during the second half of 1923. (All of them are taken from the University of Michigan scans available at Hathitrust.org.) 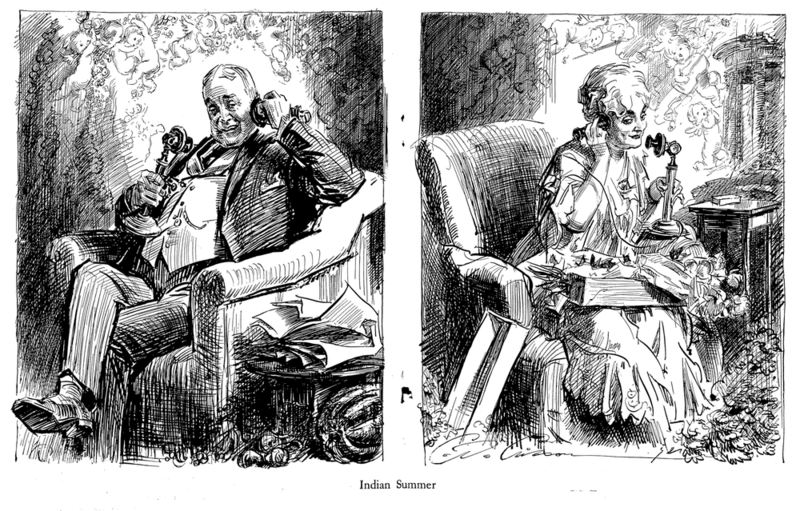 At the time, the President of Life was the aging Charles Dana Gibson, whose elegant pen-and-ink drawings had revolutionized American cartooning in the Gay Nineties, but the art director was the much more modern Rea Irvin, whose sophisticated, design-heavy aesthetic would work an even more up-to-date magic on upstart weekly The New Yorker within a few short years. 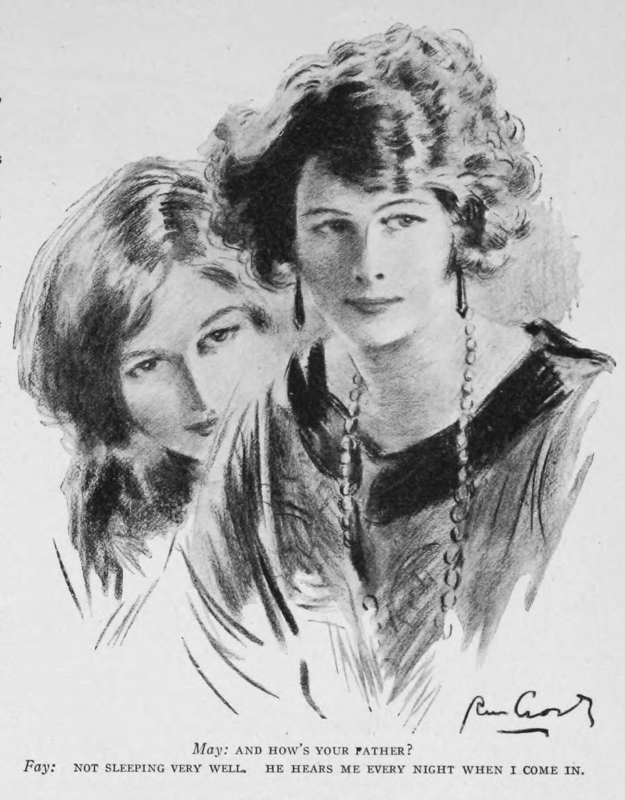 But let's start with Gibson, whose preeminence allowed him a page or two in every issue even as his gestural, richly textured style, so perfect at delineating the New Woman of the 1890s, entirely failed to capture the flapper of the 1920s. He was, naturally, on stronger ground sentimentalizing about the ways that modern technology allowed aging lovers to communicate than he was lampooning revolutionary theorists in perhaps the most pluperfectly bourgeois cartooning style imaginable. But Life, though it was certainly bourgeois, was not exclusively so. Art Young, the graphically bold Socialist cartoonist and chief conspirator behind the firebrand magazine The Masses, which had been suppressed by the government for undermining the war effort, was welcomed in its pages as well, and although some of that work was merely derisive toward contemporary fads, some of it was as anti-carceral, anti-religion, and anti-capitalist as ever. If Gibson had grown too fossilized to enter into the youthful spirit of the decade, a new wave of female cartoonists, young enough (although generally not un-self-aware enough) to be flappers themselves, was beginning to take the profession by storm. Alice Harvey, whose loose, wash-heavy style and sharp eye for social nuance would soon be poached by the New Yorker, was perhaps the brightest young cartoonist of the period, and one of the few women to ever regularly feature in the pages of Life. Harvey's needlepoint assurance in delineating the modern young woman was obviously drawn from experience; contrast her deftness with the frankly wheezing captions of R. M. Crosby, whose pretty-girl cartoons had been very popular in Life during the War but were rapidly becoming museum pieces. Percy, or P. L. Crosby, as he was signing his work then, was no relation — and indeed their work could hardly have been more different. Focusing on lower-middle-class urchins of the metropolitan suburbs, the junior Crosby took a raffish pleasure in puncturing all pretensions to gentility or decorum, as his signature creation, Skippy, would soon migrate out of the pages of Life into newspaper comic strips and his vivid, scratchy line, pulsing with life, became one of the basic templates of kid-gang comics in the twentieth century — Charles Schulz, among many others, would claim him as a forebear. Another mainstay of the newspaper page, but who only occasionally appeared in Life, was the low-key Midwestern satirist H. T. Webster, better known for creations like Casper T. Milquetoast or endless variations on couples squabbling over hands of bridge. But a cartoon that required intricate grayscale washes deserved better reproduction than newspaper presses afforded at the time. The charge against Life cartoons, especially from New Yorker partisans, has always been that the older magazine's reliance on dialogue in captions was antiquated and often didn't even require a drawing to illustrate it, while the single-caption cartoon, in which neither drawing nor caption tells a joke without the other, but together they create a perfect gestalt, was the superior and modern form. That's such a limited view of the history and practice of magazine cartooning that I don't want to dignify it by arguing against it too strongly; but the best riposte is always a cartoon with a caption in dialogue which is such a perfect and wittily-observed piece of work that no editing could improve on it. Oscar F. Howard was another of Life's regular standbys throughout 1923, but unlike nearly all the other cartoonists gathered here, he remains obscure even among magazine-cartooning fanatics like me. 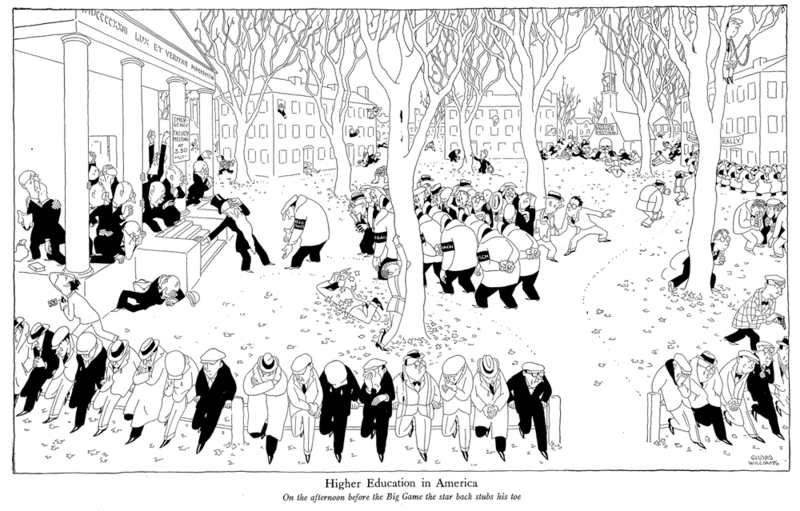 He was one of many hands who worked on an observational strip called Metropolitan Movies in the 10s and 20s, and his elegant washes helped to establish the New Yorker's style in 1925, but he drifted away from cartooning in the later 20s and I know nothing else about him. He was great, though. 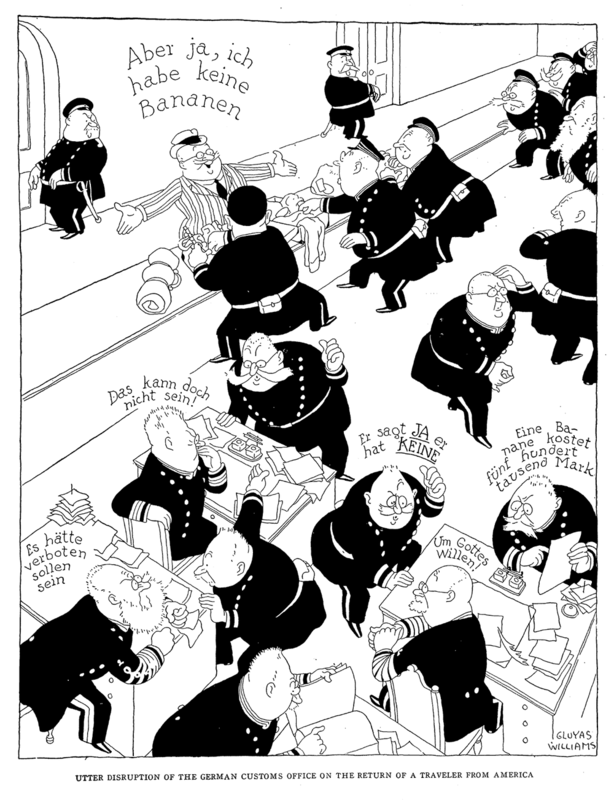 In this period, Life was making an attempt to be as much a Transatlantic magazine as a New York one; they opened an office in London, and outstanding British cartoonists like H. M. Bateman and W. Heath Robinson appeared regularly in its pages. Since the New York bourgeoisie that were its primary topic of gentle satire (if not its actual audience) were typically Anglophiles anyway, there wasn't as much of a cultural divide as you might expect. Bateman in particular, although his style derived from suave French models, was an excellent universalist, tapping into current anxieties everywhere. Both Bateman and the American Gluyas Williams (who I last looked at in 1918, when he was still finding his style) were heavily influenced by the fluid line and elegant compositions of French cartoonist Caran d'Ache, but by the early 1920s Williams was perhaps the preeminent Life cartoonist, a Charlie Chaplin of pen and ink. 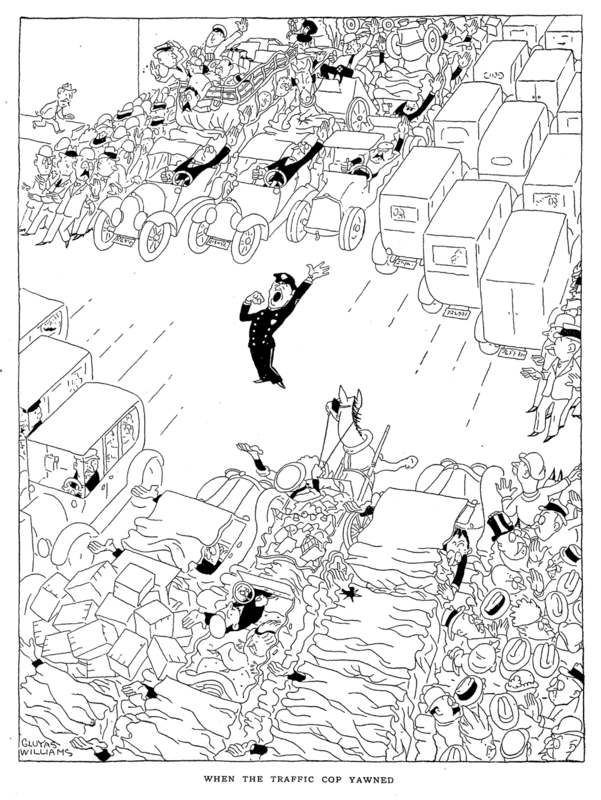 His crowded panels, full of bewilderment, mock heroism, baffled politesse, and sleek, filigreed linework, are among the great treasures of the era's cartooning, and his facility with both sequential cartooning and stand-alone panels made him one of the most versatile of the several geniuses then working in the field. 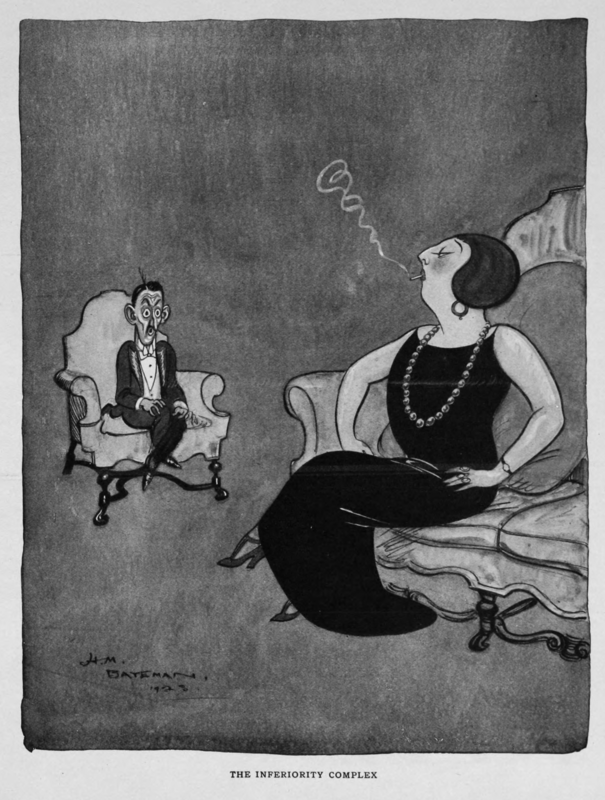 But if Williams was the preeminent Life cartoonist in 1923, it was only because he was more observational than the other most-published cartoonist that year: Rea Irvin, who was also the magazine's art director, allowed himself a generous number of pages in which to practice a profligate if rather gentle lunacy. The elegantly-drawn but escalatingly absurd series The Skeptics' Society, in which serious bearded gentlemen attempt to prove the veracity of common sayings, was one of the treasures of Life's output over the course of the year, and I'll leave you with the full dozen that saw print. This is, of course, only a small sampling of all the cartoons published in Life in the second half of 1923. I left out a lot, including some of the era's most notable cartoonists — John Held Jr., T. S. Sullivant, Harrison Cady, Rollin Kirby, A. B. Frost, Don Herold, Ethel Plummer, and on the the British side Fougasse, W. Heath Robinson, and Arthur Watts. But this web page is already groaning with the number of images it has had to open.